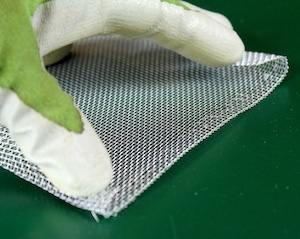 I have found aluminum screening to be an excellent material to work. 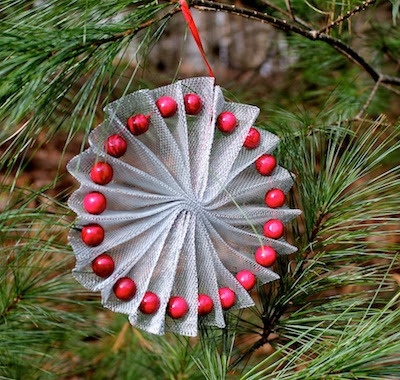 I have only just begun to explore the possibilities of using it for Christmas Tree ornaments. It started with the first ornament in yesterday's post here. Today's is a rosette design combining the aluminum with red wooden beads. 1 piece aluminum window screening 6" w x 20" long - I purchased 1 roll of 36" x 84" bright Aluminum screening at Lowes. You can vary the size to create different sized ornaments. 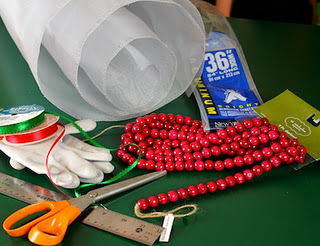 20 - 1/2" wooden red beads - I bought red bead garland and cut them off. 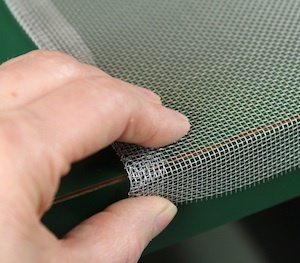 Measure a 6" x 20" strip of Aluminum screening. Place the screen along a sharp edge (I used my desk surface) and bend back about 3/4" along both long edges. The desk edge helps create a straight line. This finishes the rough edges. Fold back both long edges and crease. I used the handle of my shears to crisp the crease. 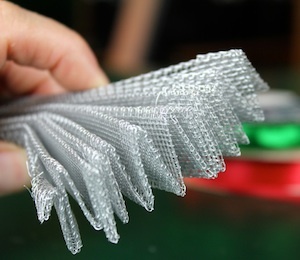 Fold the entire length of the the 20" piece into a zig zag fan with each fold being about 1". Crease them as you move along. 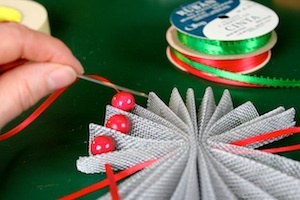 Thread a piece of 1/8" red satin ribbon and stitch through the center of the fan. 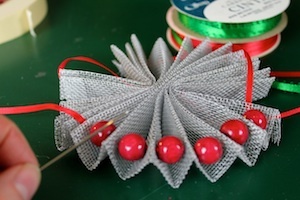 Create a loop about 2" longer than the ornament and thread back down through the center again. 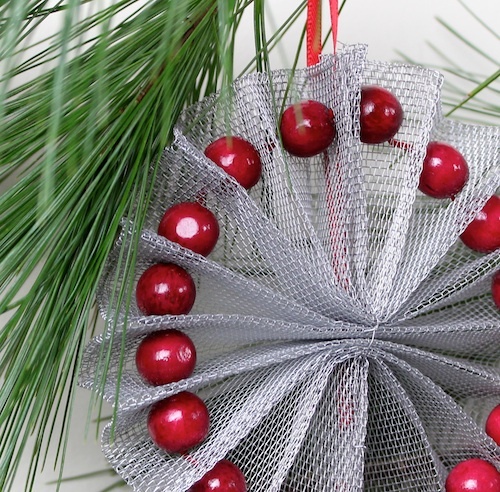 This will form a loop to hang the ornament from. 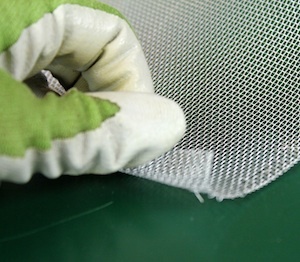 Tie a knot close to the screening on both sides of the the aluminum. This will hold the pleated screen together tight in the center. 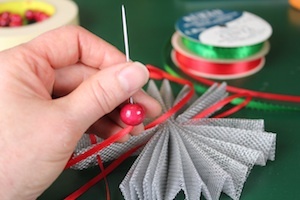 Get another pice of ribbon about 2' long and thread it on to the needle. 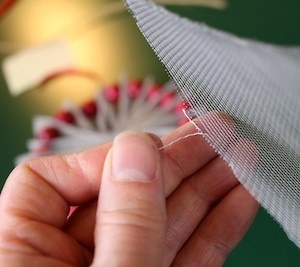 Thread the needle through the first fold of the fan about 3/4" down from the end. Leave about 4 " extra ribbon dangling at the end. You will tie up to it again when you have completed the circle. 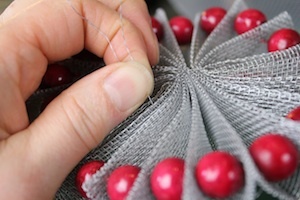 Thread a red wooden bead on to the needle. 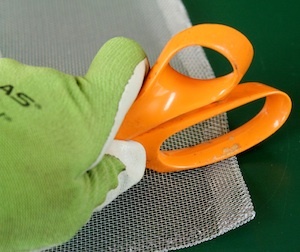 Push the needle through the next fold of the fan aiming for the same placement - about 3/4" down from the end. 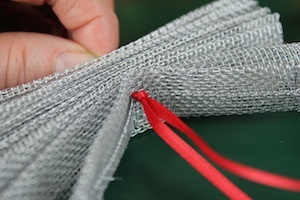 Thread through another section of the fan fold. Continue working your way around the circle. Connect the split between the two halves of screening. 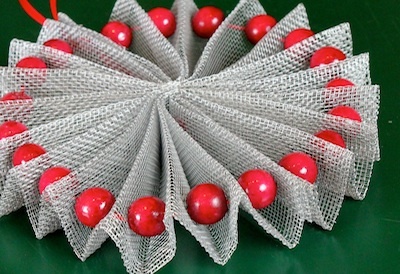 Continue until you have completed a circle of red beads. Tie the end of the ribbon to the beginning pulling tight to hold the beads in a circle. 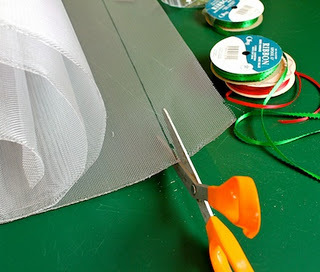 Take some leftover screen and pull off an aluminum thread from the cut edge. 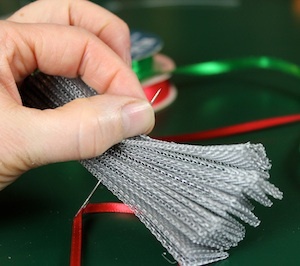 Use this aluminum thread to "stitch" together the seam where the two halves of the fan meet. You don't need a needle - just thread it through and twist the ends together. I found two stitches on the front and one or two on the back joined together the halves. It smoothed out the opening between the halves and made for a more complete circle. The end result is a beautiful rosette ornament. You can vary the size and the number of fan folds to change the proportions. A trio of these rosettes in varying sizes would make a wonderful window ornament.